How are you all doing? I hope your summer is going well! It's been a very busy summer thus far for me with lots of Quilting, Cleaning, Organizing, and Playing. I recently got back on Friday from Church Girl's Camp and have spent the weekend recovering. I'm not quite as limber as I used to be. lol. 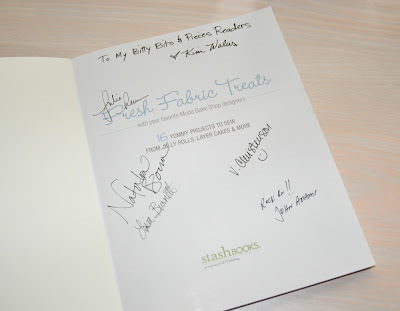 Fresh Fabric Treat Book Giveaway and Podcast. Here are a few pictures I took of the Fresh Fabric Treat Book that was displayed at the C&T Publishing Booth at Quilt Market. It was my first look at the book and it was so fun to finally see it for REALS!!! 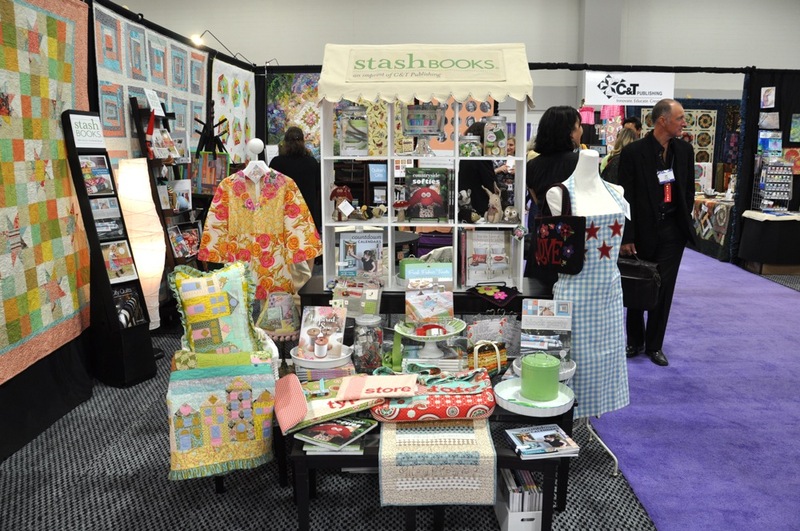 To celebrate the debut of Fresh Fabric treats we had a book signing event on Sunday afternoon on the last day of Quilt Market where Stash Books gave away 3 1/2 boxes full of books. 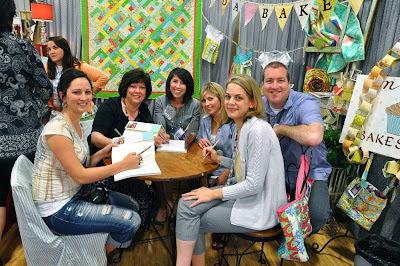 It was really fun gathering with a few of the Moda Bake Shop Designers who were able to make the trip to Quilt Market in Salt Lake City this year. Here we are posing for a few pictures while laughing and entertaining the crowd that gathered to get a free signed copy for their stores. Here's the actual book I'm giving away that I had signed by a few of the designers. I'm sorry that I couldn't get more of the designers to sign it but, not everyone was there at market and some had to leave early before the book signing on Sunday. Here's a peek at my 1st project in the book. Here's a look at my 2nd project. I had the pleasure of meeting Annie Smith from Annie's Quilting Stash at Quilt Market. Here's how it all happened. I was sitting in the dining area after the book signing just enjoying a Ham and Swiss Cheese Panini with my friend Lori Holt. We were talking about the last few days of quilt market and she was telling me that she was just relaxing and waiting for her next interview with Annie Smith. I thought that was really exciting for Lori to be doing an interview. It wasn't long before Annie joined our little group that had gathered in the dining area. It was so fun to meet her and to talk with her. 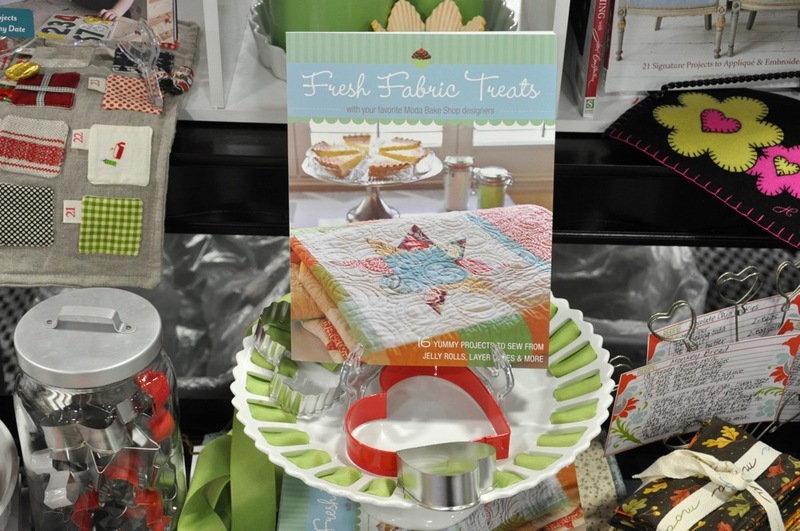 One thing led to another and before I knew it she was inviting me to talk with her after Lori and do an interview to promote the new book I'm in called "Fresh Fabric Treats" (make sure to check with your local quilt shoppes to purchase the book). Annie is delightful! 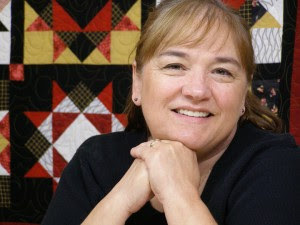 She's a wonderful quilter, appliquer, and designer along with being an amazing blogger and podcaster. You will definitely want to visit her blog often. Her most recent podcast is an interview she did with my friend Lori Holt. It's podcast #206. The podcast about me and the book is #207. You can link to it here. I took a few pictures of my projects before packing them up in a box and shipping them off to the publishers for almost a years time. I just got them back a few months before Quilt Market. 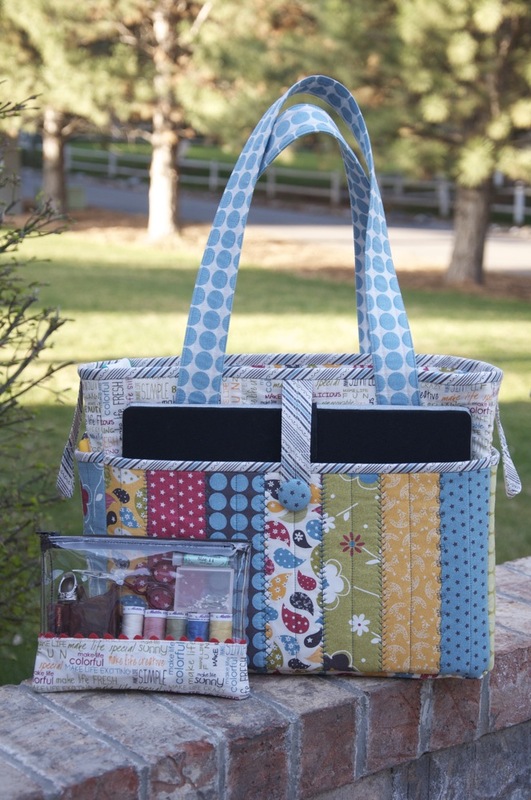 I made the "Pack N' Go Tote" with the Quilter in mind. 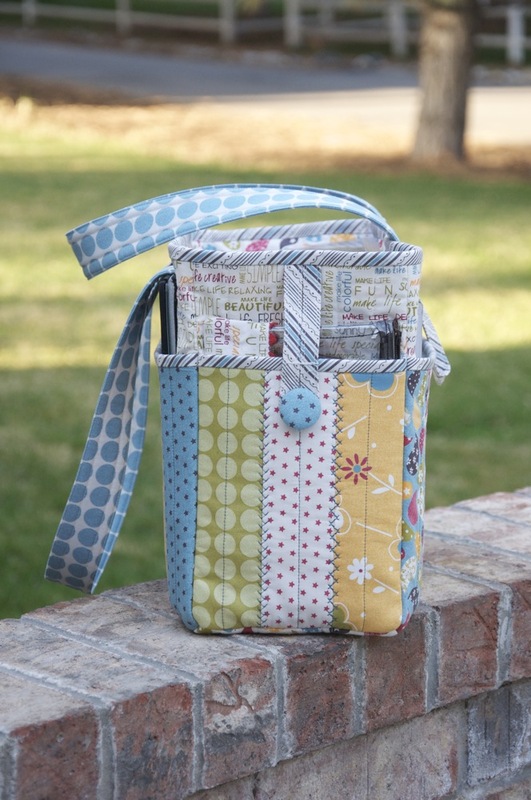 Fill it up with your current projects and take it with you on a road trip or with you to your quilt classes, quilt retreats, or even your monthly quilt meetings. View of Smaller outside pocket with sewing kit in pocket. I will pick the winner using Random Number Generator. Giveaway will end on Saturday, June 25th at midnight. The winner will be announced on Sunday, June 26th (sometime during the day). and I'm a follower of your blog. But #1 comment never wins, right?! The book looks wonderful and I love your project. I'm a follower and very much enjoy you blog. Oh how exciting! I love your bag! I would like to make them for my quilting friends. :-) Thanks for the chance! And I am a very happy follower of your blog! :-) Have a happy day! what a wonderful experience for you. I wish I could have come to the Quilt Show. Fantastic project and book...I'd love to win this copy! Thank you for the chance. I'm a happy blog follower of your's already. tried to listen to podcast, but there was some sort of error. I will try again later. Congrats on the interview. How fun! I just visited Annie's blog. Thanks for sharing it with us. I would love to win a copy of this book, I could definitely use that tote! Those projects are awesome and that tote is a must do! So well thought out. If I made that I would definitely have a better chance of remembering the supplies I need at future workshops!! I love the all in one tote project! The book looks like it is going to be amazing! Thanks for the chance to win it! I've been eying that book for a while but have resisted buying since I'm on a self imposed quilting diet. I would love to win it. You always have such beautiful projects!!! I just went on over to Anne's blog and downloaded the podcast, I can't wait to listen to it- during my lunch time. I also saw her podcast with Lori! Gotta listen to that one too! I would love to win a copy - thanks for the chance! 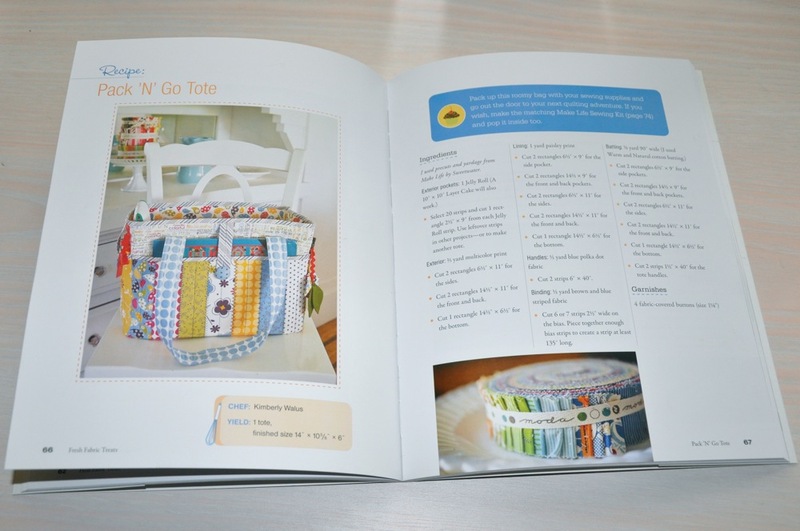 Your tote is one of my favorite projects in the book. Thanks for the chance to win! I also follow your lovely blog! Your book looks amazing. I love the tote...especially in the make life fabric. I love your pack n go tote! I'd love to make one!! Listening to your podcast now! I'm so excited about this book! Having autograph's just makes it even more special. I've visited Annie and left a comment! Off to listen to the podcast now! I love the bag. 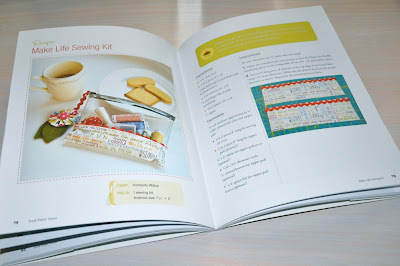 Would sew like to win this book! I already follow your blog, off to read Annie's. I would squeal like crazy to win this :) THANKS!! I follow you :) Yipee! I checked out Annie's blog and commented!! Listened to the podcast too!! I have to say that I love this book! Got my copy last week and I look at it once a day dreaming of all the projects I want to try. But my first project is gonna be your tote! I love that thing! I ordered my fabric today and I can't wait to get started. My goal is to finish before my next quilt club meeting in August! We are on break in July for the county fair so I have a little extra time. Thank you for sharing this great project with us!!! I would love a chance to win a copy of the book. Thanks for the opportunity to enter your giveaway. I just love your Pack N' Go Tote design! You really put alot of thought into it and you have made it very functional. No wonder they wanted to put it in this book! CONGRATS! I am a new follower and I have been admiring this book since I first saw it reviewed! What a fabulous pair of projects! Thanks for the giveaway! I already follow your blog. Thanks for the chance to win this giveaway. 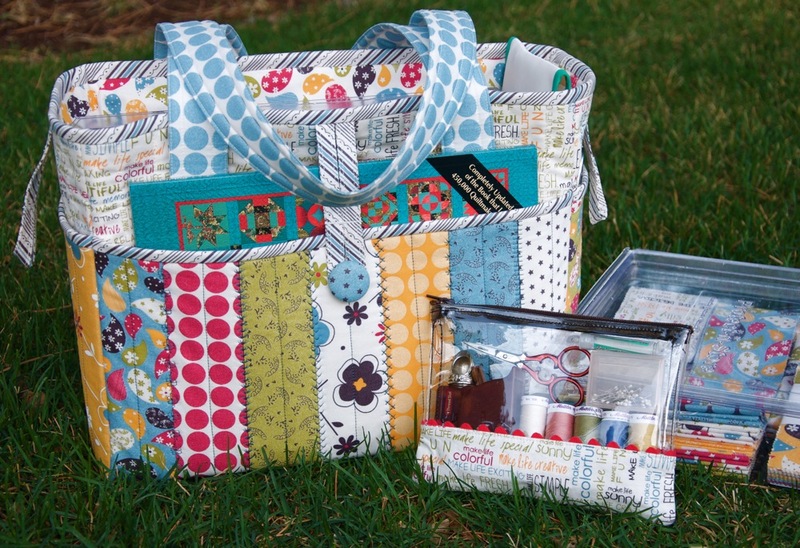 Your tote and sewing kit are great! I've never taken a class before so will bookmark so can prepare myself on what is good to take. 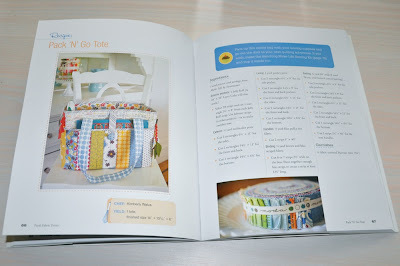 Hope to win this book - as some of my favorite blogger/quilters have projects in the book (including you). Thanks. Love the bag. Looks like it has lots of space to help me keep organized. I visited Annie's blog - and left a comment. Thanks for the dual opportunity to enter for this great book! I love your tote bag! cool book! thanks! I left a comment over on Annies blog! thank you! i downloaded the podcast and I listening now! thank yoU! Oh YES, I need to make that tote! Perfect for take along projects. Thanks for the chance to win!! I've been a follower on Reader for quite some time. It's so easy to follow along with your blog.Thanks again for the chance to win. I love your tote bag and the clear sewing bag. I would use both of those as a regular purse lol. I'm back from Annie's blog! Thanks again for the chance to win. Would love to own this book and make several of the projects! I went over and said Hi to Annie. I am a first time visitor so I am going to go back over and have a little looksie. This book is definitely on my must have list. I listened to the podcast - great. Such pretty and practical projects! Congrats on being published. I'm one of your 900+ followers. And I visited Annie's blog... plus the Moda Bake Shop for good measure. I attempted to listen to the podcast yet came up with error message that the file extension of mp3 did not match the file format. I'm lost on how to get it to work. Anyway, congrats for your interview with Annie. Wow what a great giveaway! I'm impressed with the projects in it - the Amazon listing has a great tease of what's in the book! Awesome all around, thanks for the chance! I'm now following your blog on Googlereader! I have been following through my blogreader, but now am an official follower! I visited Annie's blog and am now a folloer there too! I even worked out how to download the podcvasts to my Blackberry and am listening now! 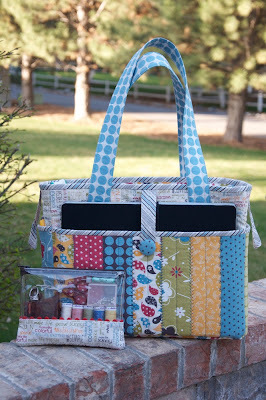 Love, love, love the quilter's tote!! Thanks for the chance to win. Of course I follow your blog. Love it. i've also use several of your tutorials. Thanks for the chance to win. I visited Annie's blog and decided to become a follower. Thanks, I love finding new blogs to follow. Great tote! I'd love to win a copy of the book. Bet all the other projects are great, too! 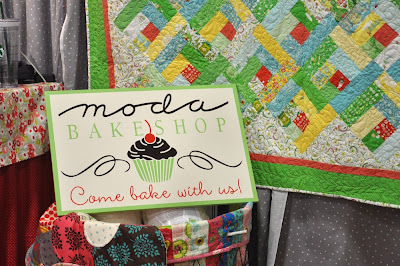 Listened to Annie's podcast (my first) - can't believe she hadn't been to Moda's Bake Shop before!!! I just love it. I've subscribed to Annie's blog for quite a while now. I listened to podcast #207. That's how I found you. Thanks for the giveaway! Thank you so much for sharing your projects and hosting this giveaway. I would love to win a copy of the book. I am already a follower... and love to see what you are working on. I just left a comment on Annie's blog. Thanks! I am definitely going to have to make that tote. It's perfect, and darling. Neat bag. So funny about the tole painting books. I think I own one of those! I listened to your interview. Take your time and enjoy the time with your little ones now. Just listened to the interview. Tears are good things. Enjoy the ride. What a great tote. I hope I win the book. I would love to make this tote for gifts and one for me. I listened to the podcast-very nice. I am now following Simplearts. Thanks so much for the chance to win! This book has been on my wishlist since I first started hearing about it. This book is on my wish list. I'd love to make that come true! This is my first time visiting Annie's blog. Looks like a great blog! That looks like a fabulous book, and I love your bag. One more for me to make. I've been to annie's blog. Love the tote. The book looks wonderful. I am a follower of Annie's Blog and love her podcasts. I have added your blog to my google reader. Your book looks awesome!! 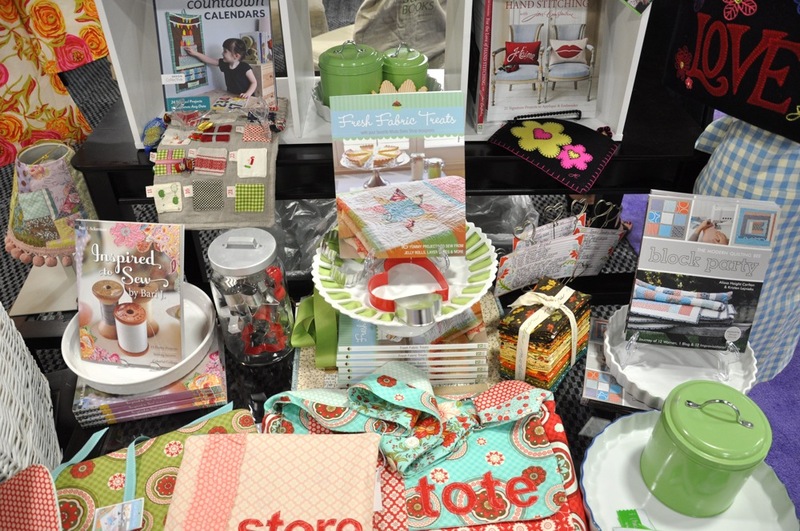 I would just love to win it and my first project would be the quilt bag! I follow your blog! Yay!! I also visited Anne's blog! I tried listening to the podcast and was having some problems(??) I will try again. Thanks for sharing! The book looks awesome! Here's my comment for entry #1! I too have been a follower for a while & I'd love to win the book! Oh I love that bag! So much versatility, and beautiful to boot! I also just became a follower of your blog! The book looks absolutely terrific. i would love to get a copy! I have just left a comment on Annies blog as well. I follow her blog, as I love the podcasts while I sew. I hope tomorrow is one of those days, so I can listen to your interview!! Looks great, I love that last little pouch! Also commented at Annie's blog! Please enter me in the drawing, I'd love to the the happy owner of the book, love the tote you made!!! Your bag design looks wonderful Kim! I'm listening the podcast now, yay!!! This book looks great - I keep seeing snippets about it online and I'm anxious to get my hands on it. Thanks for the chance to win! I've signed up to follow your blog. I checked out Annie's blog. Lots of good stuff there. I listened to the podcast. Interesting that you've worked in various types of crafts. I haven't seen the book before. I will buy it just for the bag pattern - love all those pockets! When I saw the end pocket photo that's when I knew I would have to get this book! Hi again - have looked around your blog and really like what I saw. I am now subscribed to your feed! The book looks wonderful and sure would be nice to win . I love the tote , it looks so well designed and a great organizer for going to class . Thanks for the chance . I have just visited Annie's blog and told her how much I enjoyed the podcast! Love that tote! So sweet! I think my sister would love one...she isn't a sewer, but travels alot...so much prettier than a plastic grocery bag over her wrist! I left a comment over at Annie's. Congratulations! Love your tote! Thanks for the giveaway! I'm so excited for you and the book Kim. 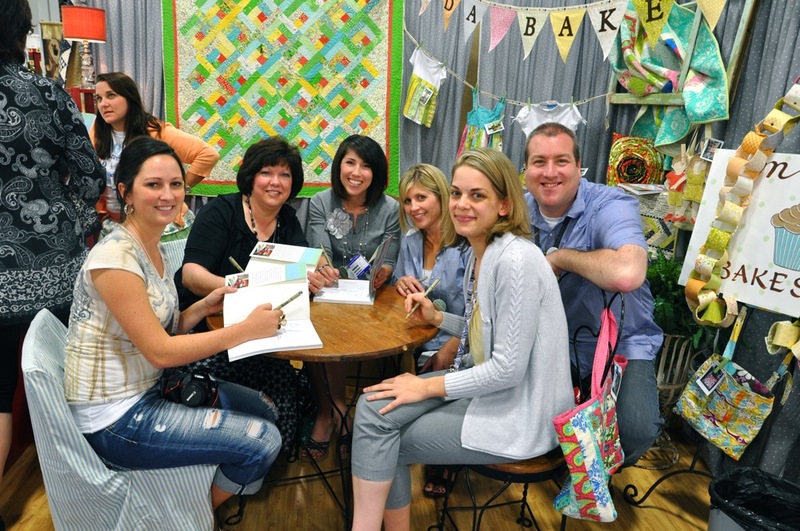 I love your projects -- they're perfect for the quilter. 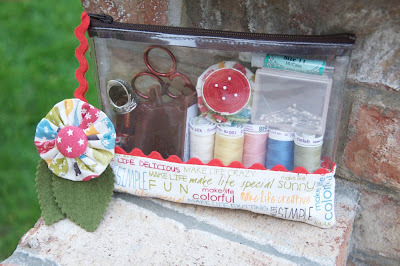 Especially that little vinyl bag -- I love using vinyl in my projects! Returning from Annie's blog. Thanks for the chance! Ooh! I still have my Georgia fabric I have yet to do anything with and it would look so cute made up into your bag! Listened to the podcast. I understand about not wanting to jump in totally since I have two smaller children as well! 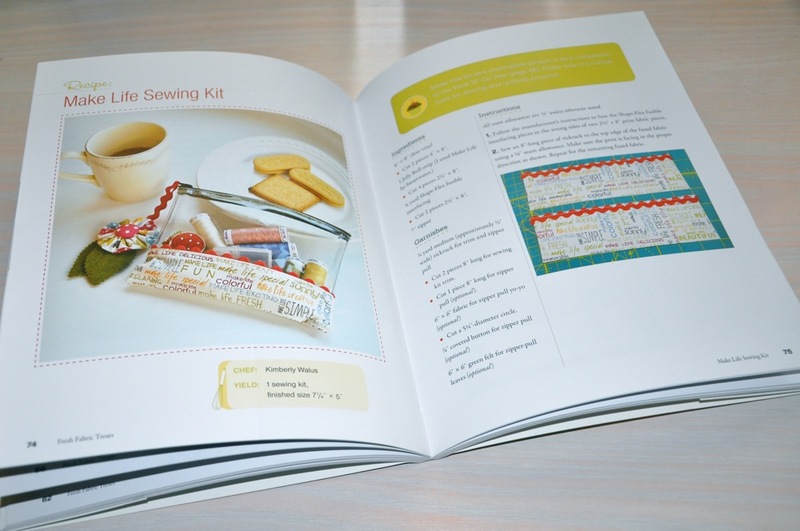 That is one fabulous book, and your projects in it are great - just your style! Congratulations, and thanks for the chance to win a copy. I'm a follower. Just found you, and glad I did! Love both your projects. I'm always looking for a way to travel with my projects....lets just say, so far, I've been less than successful! Anything designed by someone in the profession is always more detailed than a generic design! Thank you! 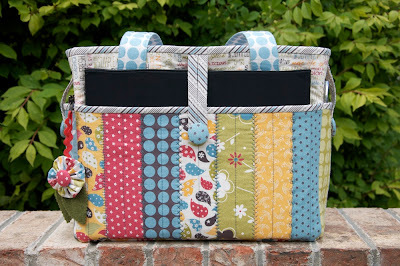 I'm a new follower, love your quilting tote! Thanks for the great giveaway. Looks like a wonderful book! 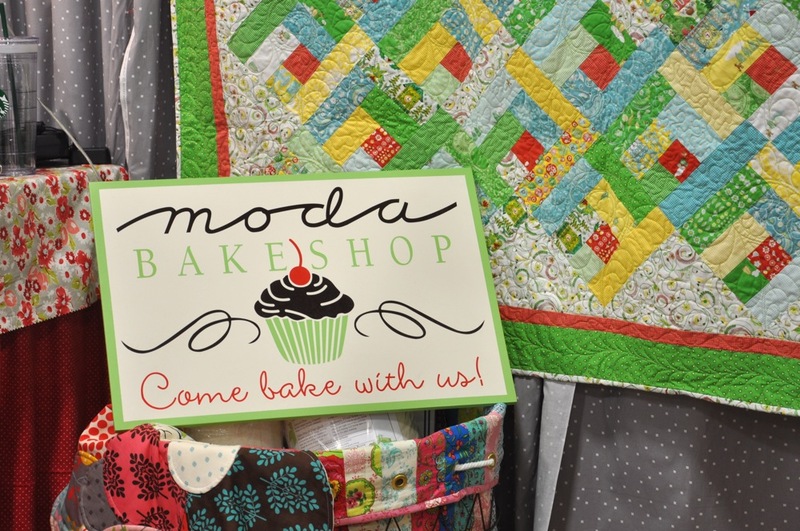 Congrats on it and love moda fabric! Visited Annie's website, thanks again for the great giveaway!